If that's all I wrote and walked away from my computer I think you'd get an idea how this goes down. 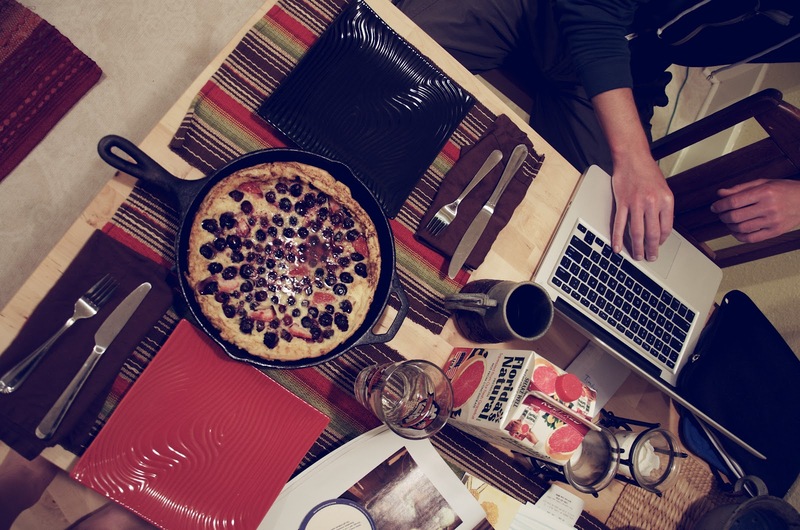 I'd talk about breakfast potatoes/hash browns, coffee in kitschy cups and tucked away cafes. Maybe I'd mention a light Pacific Northwest sprinkle and lament on the art of a coffee bean. 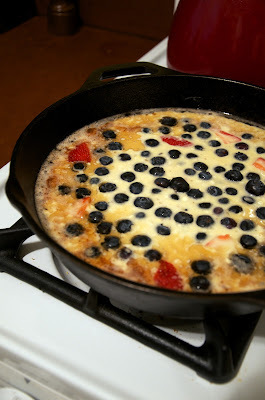 However, I think I'll ramble about berries and the beauty of a cast iron pan. Very rarely do A and I make the same thing for brunch. Sure, we've had more pancakes before mountain adventures than I can even count, but the ingredients we're never the same. Fine, there has been an egg or two but rarely are they prepared in the same way nor are the veggie mix-ins repeated. 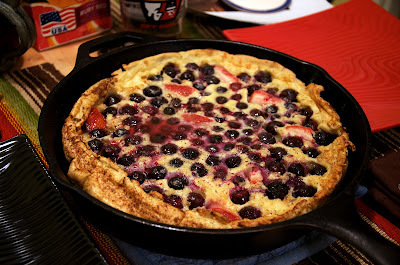 So it goes without saying that this oven puffed pancake is a winner based on the fact that it's on a second run. Same ingredients, same preparation, maybe a bit warmer weather. Well, it is Juneuary so that last part may not be true. As it comes together quickly and can incorporate whatever produce is in season, I highly recommend making this when entertaining guests or impressing your parents when visiting home. If they don't already own a cast iron pan (side note: Mom & Dad - suggestion for the one I got you for Christmas), buy them one now. They raised you, it's the least you can do. Peer pressure! Saturday morning is only 3 days away so ready the kitchen for the greatest brunch you've ever tasted! Preheat the oven to 450 F. Place the goat butter in a 10-in cast iron skillet, and place it in the oven. Combine the flour and salt in a large mixing bowl. In another bowl, whisk together eggs, almond milk milk, and vanilla. Add this to the dry ingredients, and whisk until combined and smooth. Wearing an oven mitt, remove the hot skillet from the oven (the butter should be bubbling), and pour in the batter all at once. Sprinkle the berries evenly over the top, and return the skillet to the oven. Bake until the pancake is nicely browned and puffed around the edges, 12 to 15 minutes. Remove the pancake from the oven (don't forget that oven mitt!). Cut into wedges and serve with a bit of maple syrup or powdered sugar. I made this last week and it was delicious. Then I got to thinking it might be good a savory dish so I caramelized some onions in Niter Kibbeh, added some Berbere to the mix and baked it. Really Good!